Good morning! (Or “guten/bon/beuno whatever time of day it happens to be in your neck of the woods.”) Today I’ve got a new-to-me brand, Polish ‘M (formerly Lacquerlicious). I’ve been seeing them a lot around different blogs and decided to give them a try! This is a turquoise jam-packed with white, yellow, pink, purple, and blue glitter, as well as some tiny blue microglitter that you can see in the macro shot. As you know, I’m new to the glitter crelly game, but I feel like I keep finding winners! Even packed with glitter, this polish was reasonable to work with and took three thin coats (could have been done in two). No rapping or fishing around was needed to get a good balance of glitter. All of the different colors of glitter inspired me to do an accent nail! 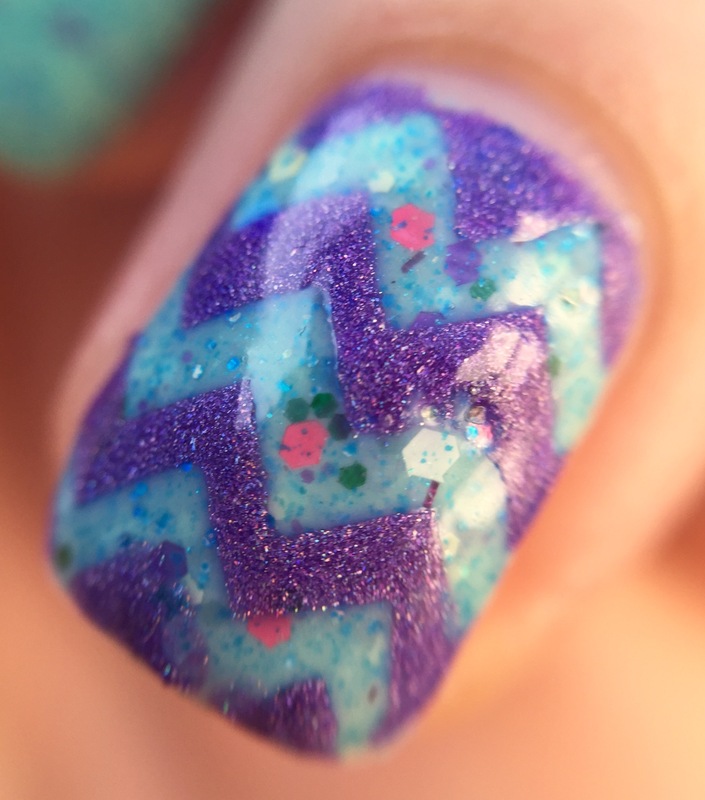 I used a zig-zag vinyl and a purple Colors by Llarowe “Oops!” polish to create the accent (and then my own spazziness and an orangewood stick to mess it up). I feel like I really need to work on my vinyls skills- how do I get those lines perfect even on my most curved nails? Let me know in the comments if you have any tips and tricks! Shopping on the Polish ‘M website was a pretty fun experience and shipping was super quick. I like that she offers minis (but even the full sized are reasonably priced). Last I looked, there was a sale on, so you might be able to catch a couple for a steal! Also, Polish ‘M has the cutest packaging! It makes you feel like you’re really receiving a present. 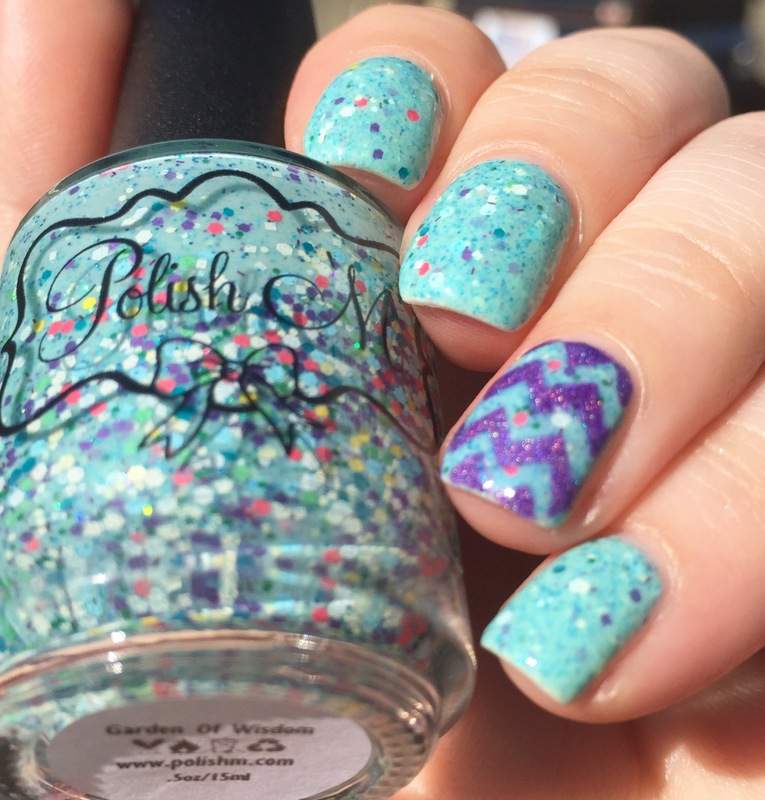 The color I used with the vinyl is a Colors by Llarowe “Oops!” polish, meaning that it’s a one-off or prototype sold as part of a mystery grab bag. I love these grab bags, and get them whenever they’re available (sometimes they also include older or discontinued colors). CbLs usually work well for vinyls and stamping, so I hoard them (also I’m a holo addict). If you’re interested in grab bags, I would say keep an eye on the Llarowe website and on her Facebook page. I’m a huge fan of Polish M and recently picked up this shade as well. It looks gorgeous with the purple chevron over it. Thanks! I think I’m going to be picking up more Polish M in the future! this is my favorite of your recent manis! I love glitter bomb crellies. This is gorgeous. The color combo on this polish is so pretty! 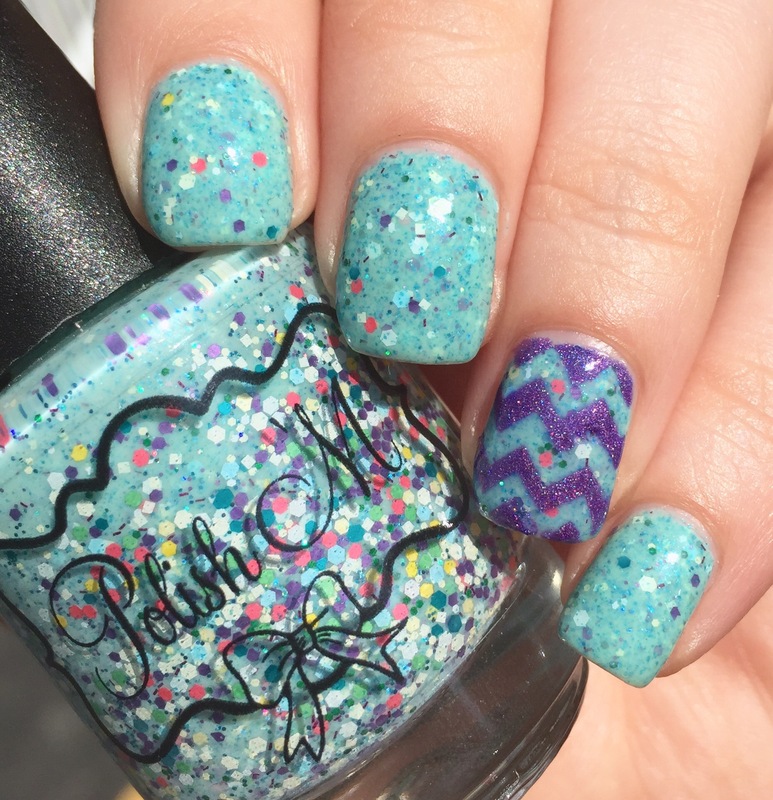 Garden of Wisdom is gorgeous and I love that chevron accent you added! !